I first had coconut shrimp in Aruba on my honeymoon so needless to say I simply LOVE it. Shortly before the wedding, while discussing Aruba and some of the seafood I wanted to eat (obvi), my dad mentioned he really liked coconut shrimp and that I should try it. Duly noted pops. After cruising around the island on the 3rd day of our honeymoon in a wild jeep with Rocky (coolest Aruban ever), my husband and I strolled into Iguana Joe’s for a fun and festive meal. I ordered the coconut shrimp and it was very yummy. 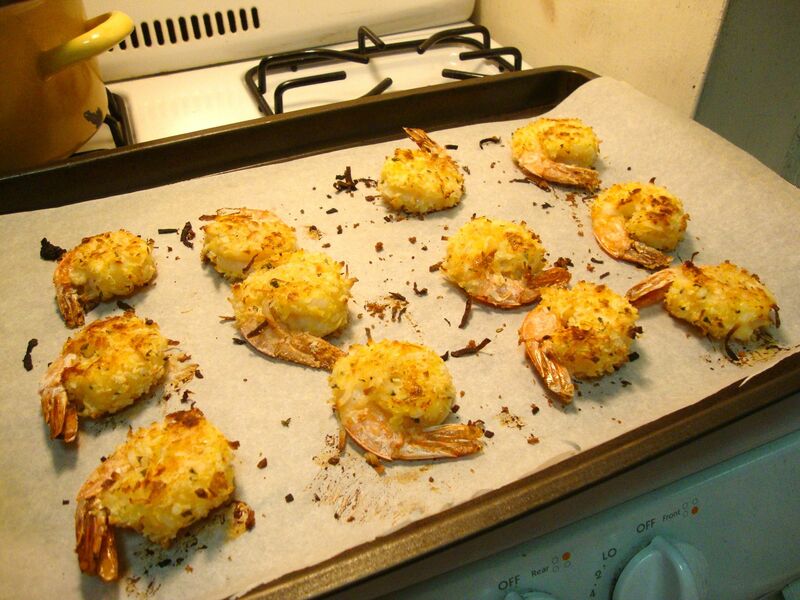 This week I wanted something light and summery and realized I HAD to make coconut shrimp. I didn’t want to fry it or have to buy fancy ingredients and I eventually found this recipe on Skinny Taste.com. I followed it very closely with just some minor changes below. I’m pretty impressed since the pictures on their site are almost identical to how my shrimp came out. As most cooks know, that doesn’t happen a lot! I can honestly say this was better than what I had in Aruba too since it wasn’t fried and was nice and light. It was AWESOME. Also, on Skinny Taste is a recipe for a dipping sauce. However I had an unbelievable jam in my fridge that I wanted to use up and I would recommend just buying a jam if you want to save time. You want something sweet and hot. Note: I made this dish just for my husband and I and served it with rice and mangoes. 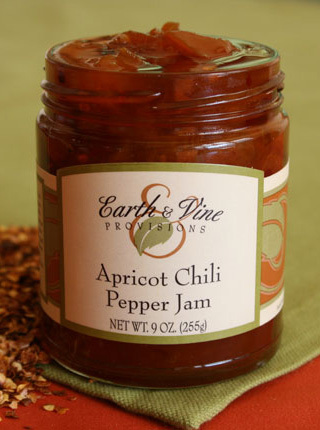 This would make a super appetizer as well. We only cooked a dozen shrimp but you could easily double this. Preheat your oven to 425°. Cover a baking sheet with parchment paper (I cut to size). Combine coconut flakes, panko crumbs and salt in a bowl. Place the flour on a small plate or bowl. Whisk the egg in another small bowl. Lightly season the shrimp with salt. 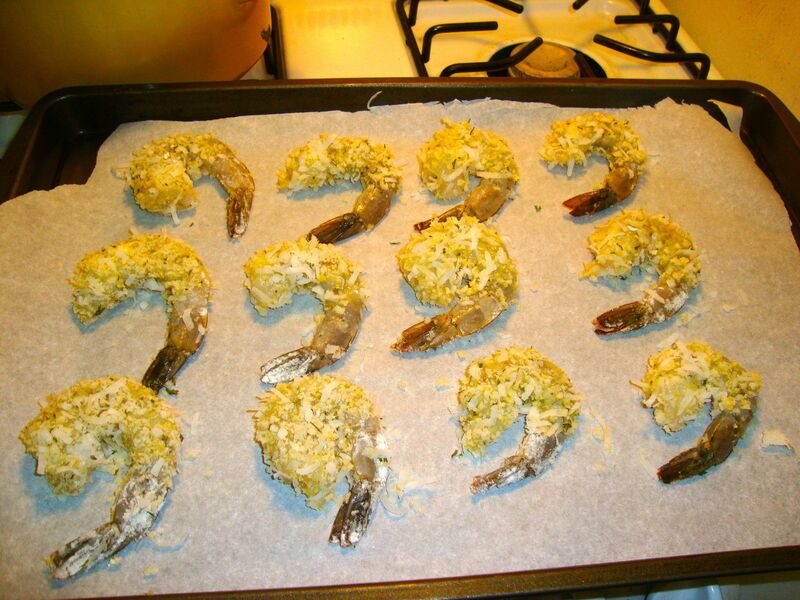 Dip the shrimp in the flour, shaking off excess, then dip it into the egg, then in the coconut-panko mixture. Lay each shrimp on the cookie sheet. Bake on the middle rack for 10 minutes. Remove and turn each shrimp over then cook another 7 minutes. Remove from the oven and serve with dipping sauce.